Bob's Wet-on-Wet Technique is a very simple, easy to follow method anyone from beginners to seasoned painters can master. Your blank canvas is transformed into a beautiful, completed work of art in just 3-4 hours! Yes…One class equals one completed painting! The classes are casual, fun, and are conducted in an easy step-by-step process. We provide all the supplies. We show up for the classes armed with easels, canvas, paints, brushes, palettes, etc.—everything necessary to complete your painting. All you need to do is arrive ready to have a great time creating your own world of "happy trees, flowers or critters." Your WET PAINTS! instructor, Judy Stubb, has been painting with the Wet-on-Wet Technique for over 15 years. She became certified in 2003. She teaches Floral, Landscape, and Wildlife painting and gives all her students a lot of one-on-one attention. WET PAINTS! teaches at Lake Oswego, West Linn, Chehalem (Newberg), Troutdale, and Wilsonville Parks and Recreation. Private classes are available as well. Or, you may gather a group of friends together for a fun time! Classes may be set up anywhere—your home, place of business, recreation center, church, meeting room, or anywhere with room for a few tables. One 8-foot table accommodates 2 to 3 students. Invite a bunch of friends and acquaintances to join you in the Joy of Painting. We arrive at the location of your choice at a time convenient to your schedule. We bring all supplies necessary to paint the project of your choice. We carefully protect the floors, tables and students. All you need do is have a fun time with your friends painting a beautiful picture. Groups of 10 or more receive a discounted price with the host at no charge. Please allow 5 hours minimum from setup to take down. If you wish, we can help you find a suitable location to host your WET PAINTS! party. Groups currently doing this are having so much fun they are scheduling the next get-together before they leave the class! Find out today what you are missing. WET PAINTS! 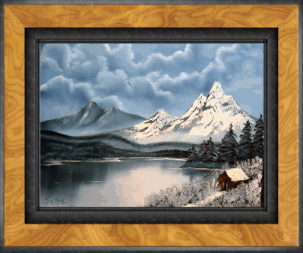 is also a retailer for all Bob Ross painting supplies from easels, to paints, palettes and brushes.